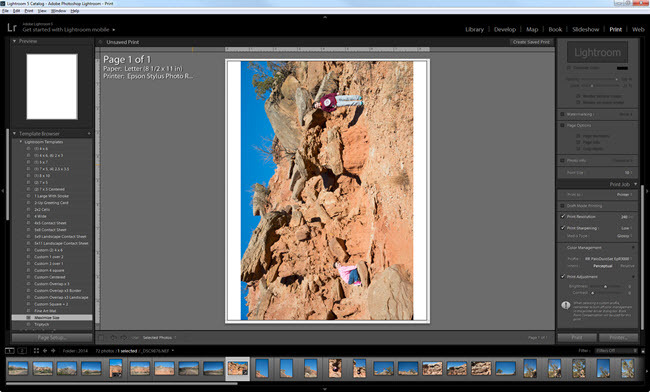 Place a check box next to any ICC printer profiles that you'd like to use in Lightroom in the future. All Red River Paper profiles start with "RR"
You'll now have any checked color printer profiles available for selection in the menu at right. 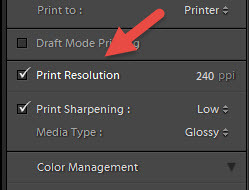 Click on the profile's name to use it for your print job. Start by choosing the Media Type. The correct choice is included with instructions files that come with each profile download. The name of your Red River Paper product will not appear in this list - only Canon brand papers. Next, set print quality to High for best results. Under Color and Intensity click Manual then Set. 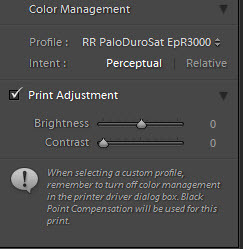 The Manual Color Adjustment menu will appear. 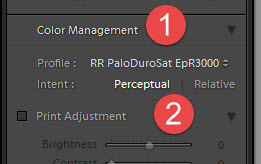 Verify that under the Matching tab Color Correction is set to None.